This post is not about a recipe per se, but more about how to create different looking dishes by using the very same ingredients. 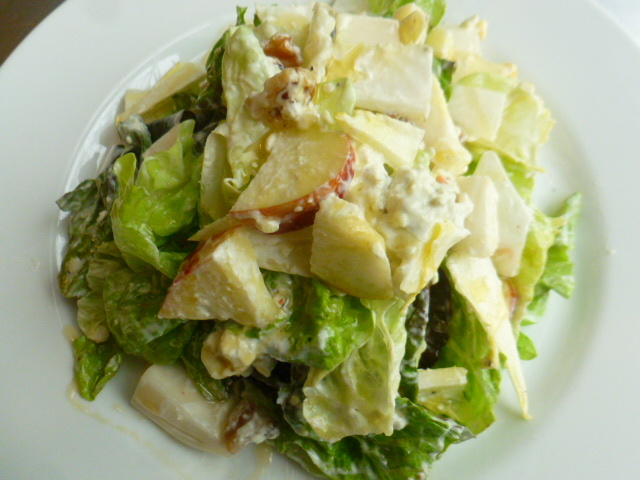 The basic combination I’ve used – blue cheese dressing, apples and walnuts – is classic for a good reason, as they match so wonderfully in flavor and texture. To these I’ve added beautiful golden Belgian endive, which added delicate flavor and crispy texture. A drizzle of honey adds just the right amount of sweetness, to balance the saltiness of the cheese. Once you gather all the ingredients, you can choose which one of the serving options is suitable for your purpose. I’m sure you’ll enjoy each one once you’ll try them. * When buying Belgian endive, buy only ones that are pale yellow in color and keep them away from light. Green ones were exposed to light and will be bitter. 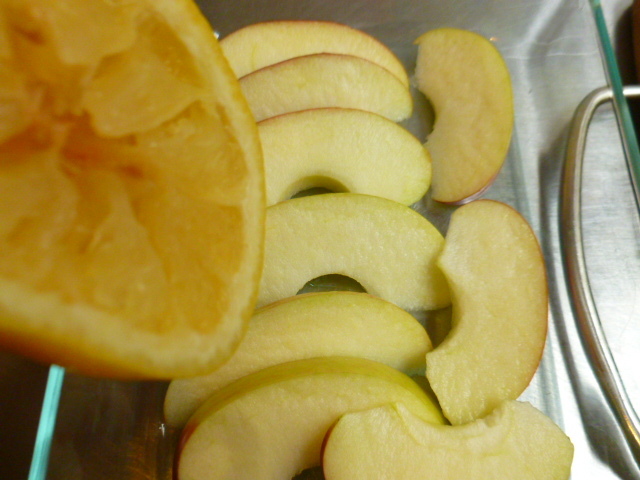 * If you plan to slice the apples beforehand, drizzle the slices with fresh lemon juice, to prevent browning. * Other nuts can be used instead of the walnuts. * While the ingredients can be prepared beforehand, assemble the dishes as close to serving as possible. * Leftover dressing is wonderful as a dip for crackers, celery sticks, or Buffalo chicken wings. The dressing can be made up to a day in advance. Keep in an airtight container in the fridge. Bring to room temperature before serving. Separate the leaves of 1 endive, and cut the bottoms into spears. 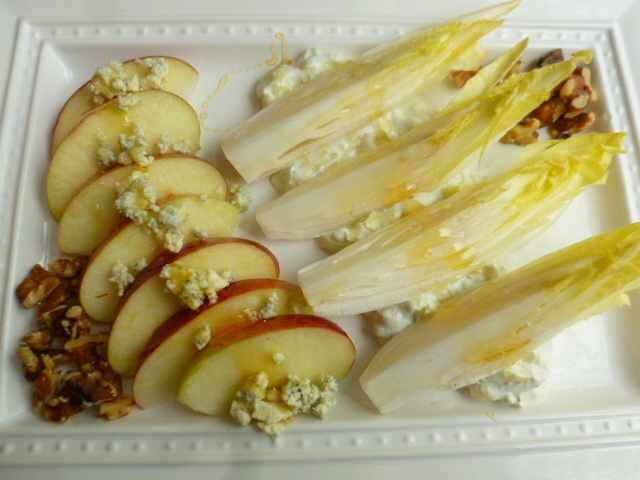 Fill the endive “boats” with teaspoons of the blue cheese dressing, scatter small cubes from ½ crisp red apple, ¼ cup crumbled blue cheese and a handful of slightly toasted walnuts on top. Drizzle with 2 tsp honey and serve. Wonderful option for passing around in finger food party or part of brunch buffet. Half and core 1 crisp red apple and slice thick. Cut 1 endive into 4, lengthwise. Arrange the blue cheese dressing on a serving plate. 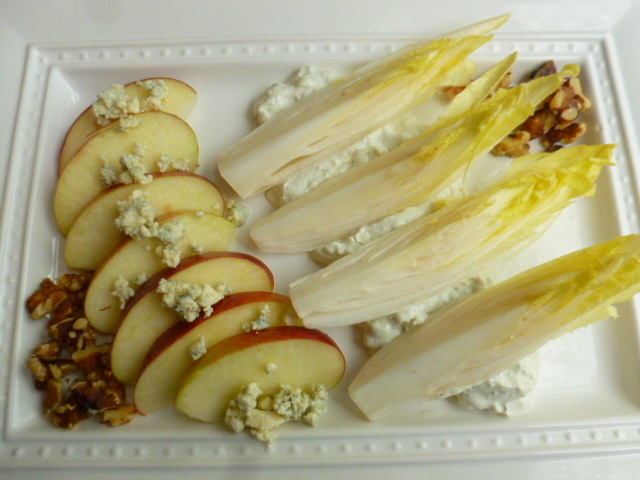 Place the apple slices on the side and the cut endive on top. Add 1/3 cup slightly toasted walnuts on both sides. Scatter ¼ cup crumbled blue cheese on top, drizzle 2 tsp honey on top and serve. This option is great as part of brunch buffet selection. Roughly cut 1 endive and 1 crisp red apple. Mix with washed and dried leaves from ½ head of red lettuce. 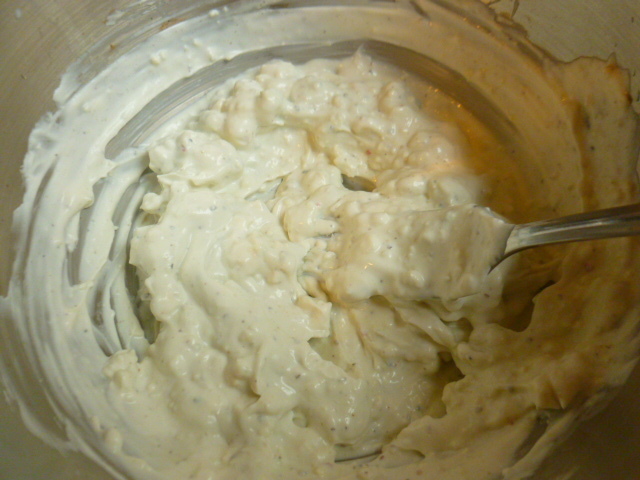 Add blue cheese dressing and a handful of lightly toasted walnuts and mix lightly. Drizzle with 2 tsp of honey and serve. Perfect for lunch. I take the easy way out with dressings and keep several flavors of the refrigerated kind on the refrigerator door shelf – Bleu Cheese, Jalapeño Ranch, Ginger Sesame, Pomegranate & Blueberry, and the ever-popular Cole Slaw – and then personalize them to suit the dish at hand. Adding a jar of minced ginger always at the ready to the mix can make anything on my plate sing with happiness! 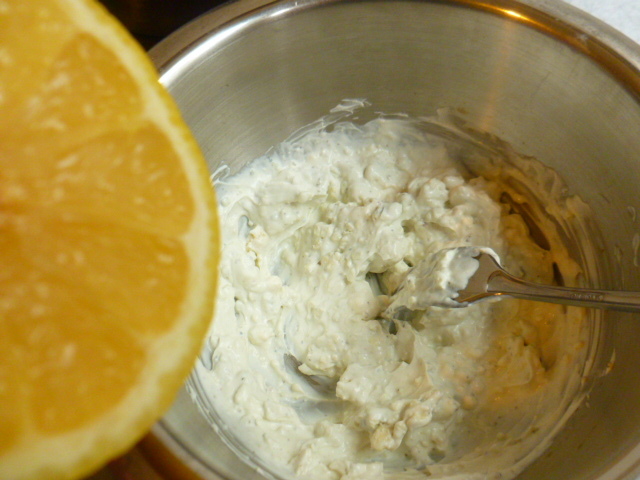 Often I add either homemade buttermilk or crème fraîche to cut the intenseness when adding to something delicate. Apply gently with a fork and you won’t overwhelm your delicious food, and – BONUS – keeps calorie count in check. I have apples and plenty of pecans, so endive will be a new purchase for me. Must try it! Some store bought dressings are very good, but I’m still old-fashioned with preferring homemade. I’ve seen the endive in the store, but the price was scary! I presume it is fairly light, so a small sample shouldn’t break the bank. 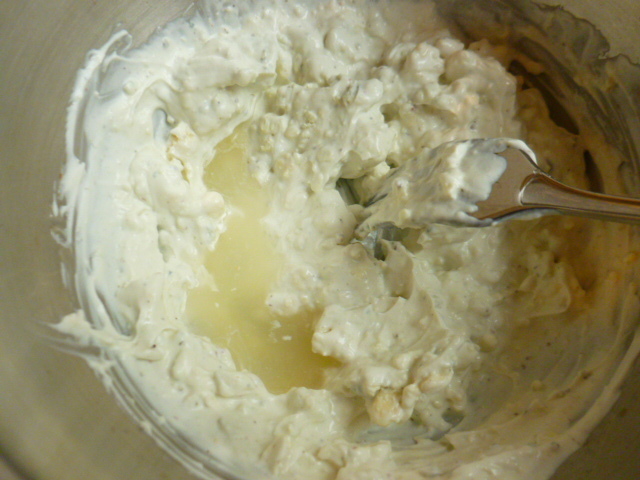 I should go back to making my own mayonnaise and then doing “stuff” to it as indicated, but that task has fallen by the wayside since the refrigerated dressings are satisfactory when embellished, and I use so little of them. They are frequently on sale for $2.50 for a pint, and I’ve gotten lazy in my old age. ;-> I keep thinking I will do it, but then sloth descends on me. Yes, for small amounts good quality store bought is a great solution and you can’t really get that price with homemade. As for the endive, it is very light and so not as expensive as it looks. The price also changes dramatically from time to time. Such an intriguing post! I did not know that about endive. I’m fact, I never consider buying it because I’ve always thought it was bitter! Makes me almost want to go out to the grocery store to buy some yellow Belgian endive! Thanks Ronit! 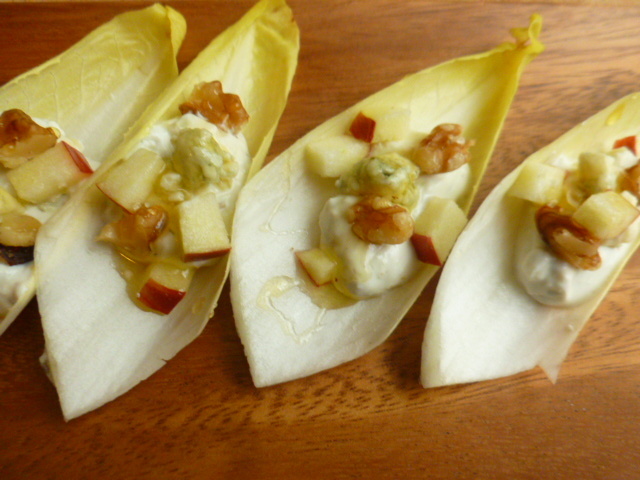 When kept away from light Belgian endive has delicate flavor and wonderful crispy texture. It’s worth looking for and experimenting with. Apple and Blue Cheese are so great! Thanks for the tip on green endive…I never knew that! As for the options…#1 please! Wait, no option 2…hehe…okay, #3. They all look and sound fabulous, Ronit. Option 1 may be the one I try first…it looks like a great appetizer for my next gathering. Thanks for sharing! I could totally live on this beautiful salad in the summertime Ronit. I’ll have to start using Belgian endive more than I do, your tips were great thanks! Love the crunch, and the sweet/sour combination. All 3 options sound great! 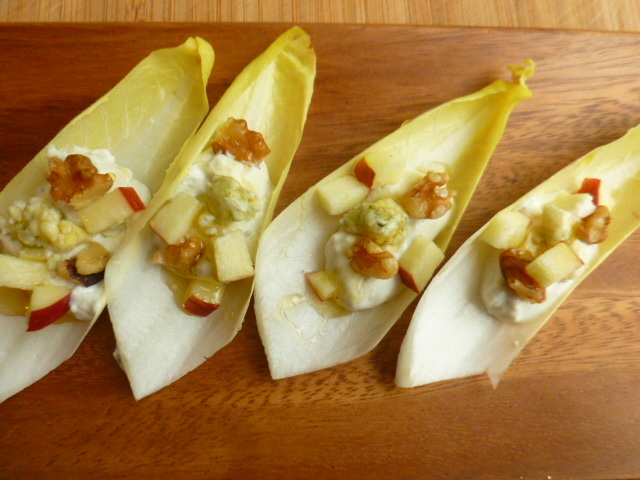 I’ve never prepared endive, but will get some & make this dish. Thanks for sharing! Thank you Sharon! I’m glad you liked all the options. It’s my pleasure to share. Yum, this looks great Ronit! 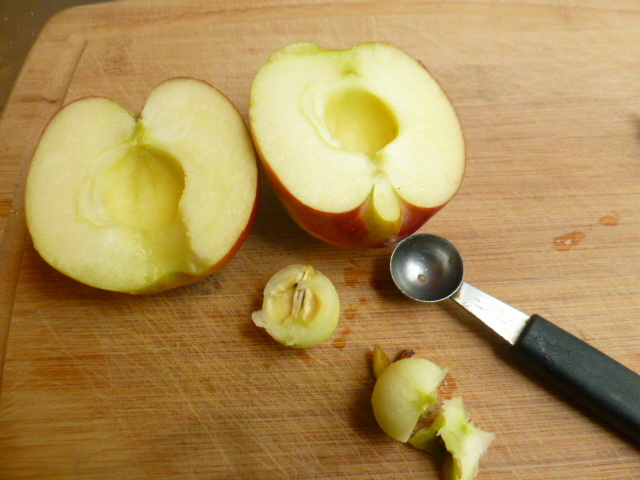 I’ve often served apples with blue cheese, and these 3 options look wonderful. It’s amazing how easy it is to create 3 distinct and beautiful dishes/presentations. Thank you Sheryl, I’m glad you liked the idea. Apples and blue cheese are such a great match and it’s really fun to play with mixing and presentation of the same ingredients. What a lovely, light salad – love the combination. Just pinned it and will be making it soon. Thank you!! This is my favorite combination of flavors. 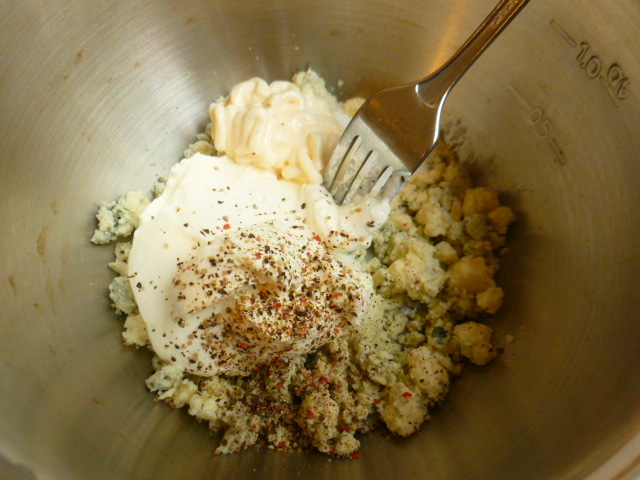 Your blue cheese dressing looks divine and is so easy to make. I am saving the recipe. Also liked the tip about buying endive. Thank you Sandhya! It’s one of my favorites as well and I make this dressing often. I have made this & it’s very popular.